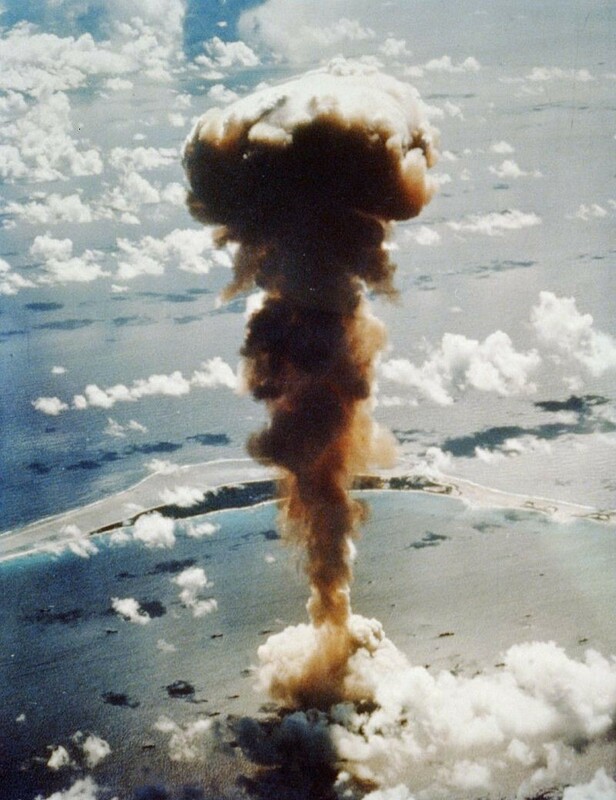 On a sunny Sunday in June, 1946, a Los Angeles resident switching on the radio to tune in to the ball game or “Mystery is My Hobby” might have heard something very different- audio of the atom bomb tests at Bikini atoll. It was the first of two such tests of the United States’ new nuclear power, which had been used against Japan in August 1945 with devastating effect, though bringing about the end of the war. The first test, called Able, took place on June 30 1946 (July 1 in the Pacific). Local residents were evacuated- never to return to their island home- along with military personnel. The bomb, dropped from a B-29 superfortress by the 509th Bombardment Group, was named Gilda after Rita Hayworth’s character in the film of the same name, which began its Los Angeles run on April 26, 1946 and was still showing in some neighborhood theaters. The AP reports that the first atomic test bomb to dropped would be adorned by Rita Hayworth’s image and named Gilda, for her character in the recent film of the same name. At the beaches, where reported crowds of more than a million from Malibu to Newport were enjoying the mild weather, lifeguards reported a “noticeable exodus from the surf” as the 2pm local airtime neared. Bathers “huddled around radios on the sand” as, thousands of miles away on another beach, the tests got underway. 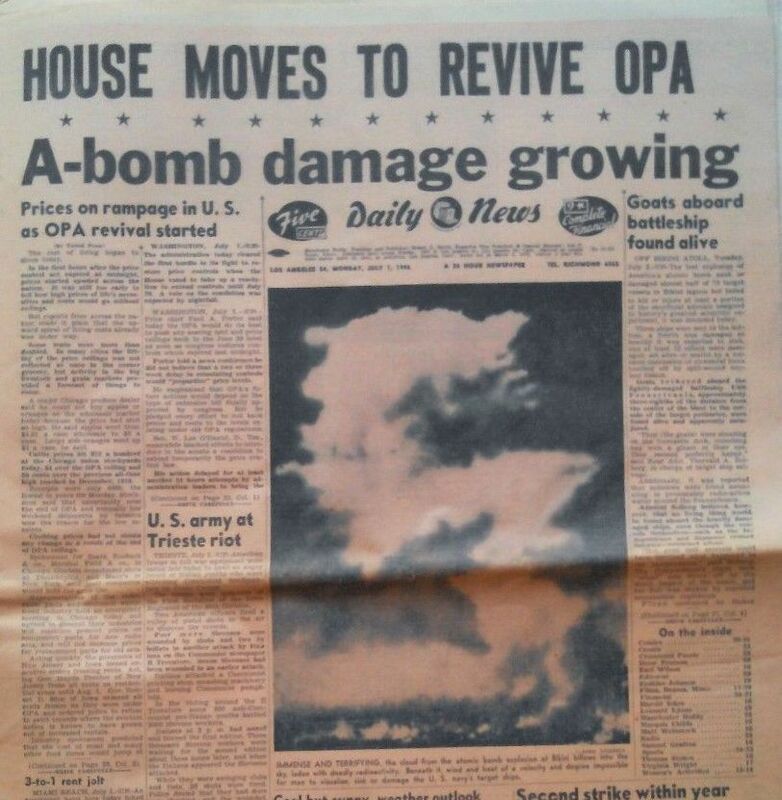 The Los Angeles Daily News front-page coverage of the A-bomb tests at Bikini atoll, 7-1-1946. On February 1, 1951, pioneering woman photographer Helen Brush Jenkins would capture the first atomic tests at Nevada from the roof of the News building. L.A. could see newsreel footage of the test two weeks later at the Pantages Hollywood and R.K.O. Hillstreet theaters, screening with the Danny Kaye musical The Kid From Brooklyn and The Falcon’s Alibi. On August 1, 1946, the Owl Drug store at Sixth and Broadway, by special permission of the U.S. Government gave the first public showing in downtown L.A. of Uranium 235, “The Source of Atomic Energy” which patrons could see while picking up some toothpaste and suntan lotion. 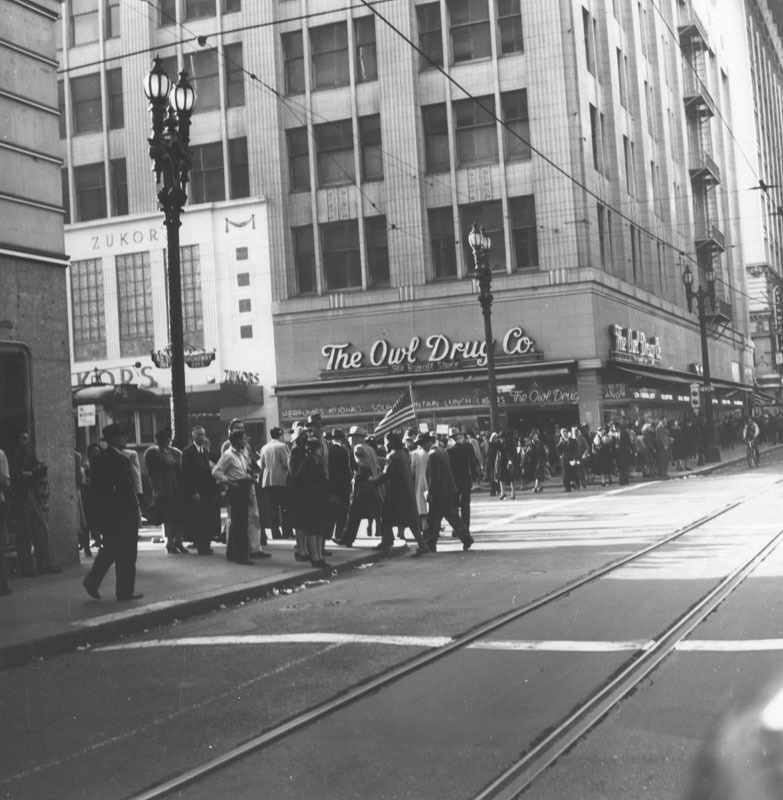 The Owl Drug at Sixth and Broadway, where Uranium was displayed in the Broadway-facing windows in early August, 1946. LAPL. The second test, Baker, was carried out on July 24 (July 25 in the Pacific).